Skipping soft plastics has got to be my favorite bass fishing technique. When I see a stretch of docks or low hanging trees my palms get sweaty. I know that the fish will be there taking full advantage of the shade and cooler water. Although this technique can be used at any time during the bass fishing season, it is best when the water is warm and the sun is high in the sky. The shade that the cover provides is not only beneficial for the cooler water but also gives the bass a fine hiding place to prey on unsuspecting dining pleasures. The main idea behind skipping is to get your lure as far back into the cover as possible. Many times the fish will be holding in very shallow water and the only way to target them is to skip your lure much like you would skip a rock. Boat docks and pontoons are my favorite targets. If I need a big fish while fishing in a tournament I always head to the docks or trees, many times I target both. When this bite is on, it can provide many fishing successes. In the right conditions, such as warmer water and bright hot sunshine, this can be the best bite of the day. I can not count the times that I have pulled 4, 5 or even 10 fish from the same cover. It is truly amazing how many fish can be under on dock or tree. To present your lure in the best way, I recommend a bit shorter spinning rod. I prefer a rod that is 6’ or shorter with a good backbone in a medium light power rod and a fast action tip. There are many rods on the market that fit this bill. Attached to the spinning rod, I like to have a smooth action open face spinning reel. The reel should be balanced with the rod. Too large of a reel and it will make the motion needed seem awkward. Too small of a reel will just not fit the rod correctly. Make sure you match your line to the reel. One thing to remember is that the lure needs to get deep into the cover. Get a reel that has a high bearing count of at least 7 that provides a smooth action and a strong front drag. The line that you will be using should be light enough to get your lure to cast deep into the cover but heavy enough to get a big fish back out of that cover. I recommend at least 10 pound mono that is very abrasion resistant. I also like some of the newer super lines that are on the market due to the strength that they offer. Nothing is worse then hooking up with a big fish just to have it break off on the way out of the dock. Flip the bail open on your reel like you are going to make a cast. Make sure to hold the line so that it does not fall to the water. Leave a couple inches hanging from the tip with your lure dangling down. Point your rod up back away from your body. Swing the lure toward your target keeping the rod low and parallel to the water. When you swing it back out toward the target in a smooth level motion made with the rod tip let the line loose just as the lure points to your target. Try to get you lure to hit just in front of the cover or even slightly inside the opening you are looking to hit. Make the lure skip just as you would if you were skipping a flat rock across the water. To get the maximum penetration into the cover make sure you have a good follow through with your rod, keeping it pointed at your target. Keep in mind that under docks and under and around trees there will be obstructions that are going to cause you to hang up. You will get you hook stuck every now and again but this is just part of the deal. Once you are more proficient with this technique you will learn how to work around these obstacles. Skipping is just an underhand swing that sends your lure sailing into and under your intended target. It should be used to target bass that are in holding tight to cover. This technique can be used in any water clarity and sometimes the cleanest weed free docks are the best spots. There are several key areas I look for while skipping. Docks that are isolated away from other can be great. I also target pontoons that are covered in spider webs. Why you ask? Think about it for a second. If the pontoon is covered with webs, it has been sitting there for a while and no one else has targeted that boat. 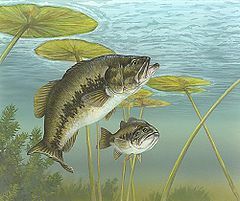 The bass have a secure place that they have most likely started to call their home.